7am. that's when i woke up this morning. though i only had 30 minutes, it took me an hour to get ready, pack everything into the car, double check that i didn't forget anything, before i drove to dan & cymara's place in allston. i waited outside while dan came downstairs, a slight drizzle wetting the landscape. he went to the bank, while i waited for cymara, who was still getting ready and feeling a bit under the weather. we took the 90-84-91-95-695-295 to long island. it rained the whole trip down, which didn't help much in terms of visibility but did force me to drive slower, which was good because i am a notoriously fast and reckless driver. at one point we even saw a highway accident, one of the car hit in such a way that the front of the car was all smashed up and the whole vehicle was facing the wrong direction of traffic. once we entered new york we found a great jamaican radio station, which kept us pleasantly distracted as we encountered a heavy patch of highway congestion. who knew colonics were so popular within that community? reggae song "girl with blue eyes" is also my new favorite. on the long island expressway, we heard billy idol's "white wedding" on an 80's station, very fitting music for the day. the motel we got, the royal inn of manhasset, was this seedy retro dive a few blocks away from the actual church where the marriage ceremony would be held. it was built on a steep hill and the outer façade made me think tiki even though the decor was more lounge. one wall of our room was lined with mirrored tiles, which made me think of all the strange men who've flexed before these mirrors. the room also had a distinctive motel room smell, a slight mildewy aroma mixed with various disinfectant solutions. with just one hour left before we had to leave for the wedding (3pm), the three of us quickly got dressed. it took a while for me to tie my tie, even with the help of printed instructions, having gone a long time without having to wear one. on television was an a&e documentary on palm beach high society (trust fund kids, we all love them! 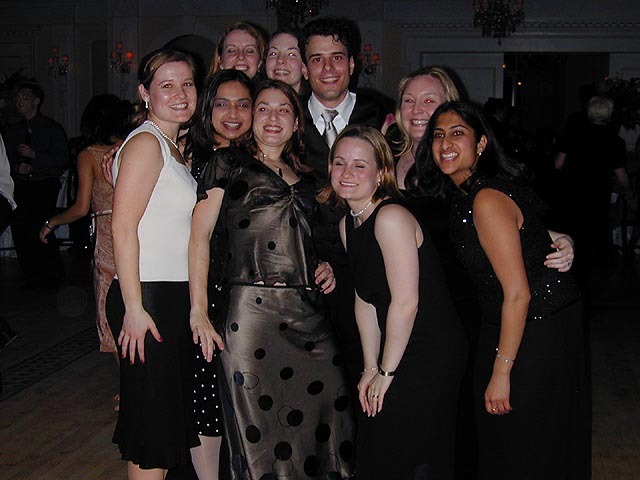 ), which little did we know would fit in perfectly with the kind of people we'd be seeing at the wedding. a funny thing happened when we got to manhasset: the weather suddenly cleared up. i should've believed dan "cloud-whisper" kuehner when he told me it'd be nice weather once we got to new york. what had been serious rain clouds earlier during the day now cleared away exposing a beautiful blue sky on a warm spring day. i had hoped it'd keep on raining so i could caption the day, "the monsoon wedding." we drove to the church, found a place to park, then went inside. we saw a few familiar faces here and there, but we were definitely the minority. john came out to greet us, as more and more people started arriving inside the church of st.mary. we saw john's parents and i met his mother for the very first time. the ceremony started with the parents and grandparents walking out first, followed by the best man (john's brother tom) and the groom, then the bridesmaids accompanied by the groomsmen. 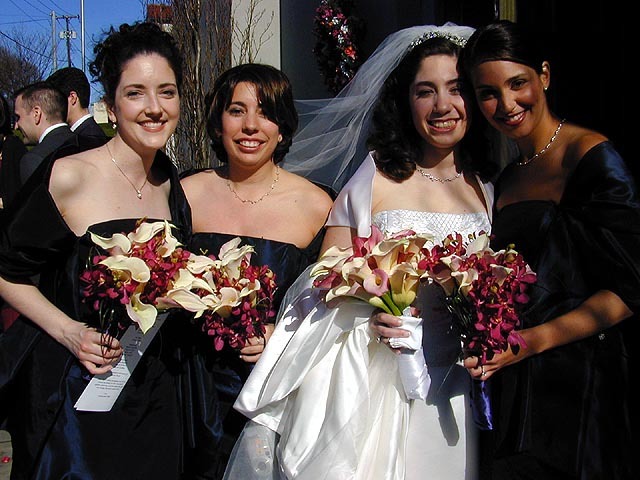 i was surprised that the bridesmaids wore black, but this is long island. megan, one of the brisdesmaids, saw dan, cymara, and i and waved (we waved back cautiously, not thinking that one of the bridesmaids would actually be waving at us!). up and in the back of the church, live musicians played from where the organ player would normally sit. finally, walking down the aisle, the father of the bride came with the bride herself. i actually got a little bit choked up when deanna's father presented her, it was such a bittersweet moment, an intensely happy occasion, the marriage of a daughter, yet at the same time a sad occasion as it was also the loss of a daughter as she became somebody's wife. 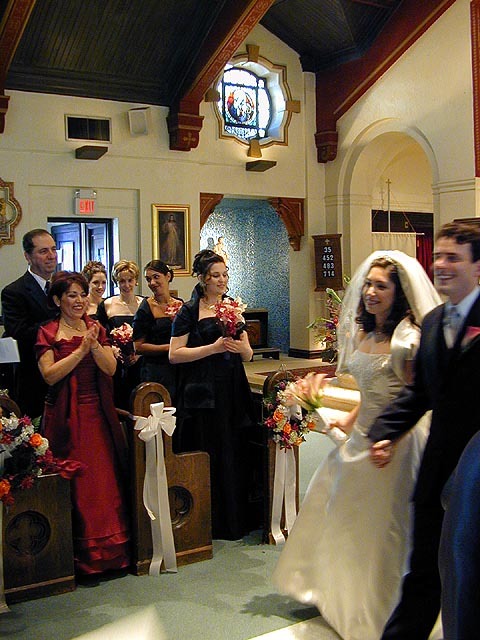 john and deanna walked up the altar and sat down on a bench as the priest gave the catholic service. i've only been to a catholic service once in my life out of curiosity back in college, and never a catholic wedding until now. there were a couple of readings, the actual exchanging of vows, some singing, and some praying, followed by eating the body of christ time. to be honest, up to the point of the vow exchanges i was okay, but then it got scary as the wedding became just like a catholic service, with the obligatory shake-hands-with-your-neighbor "peace me onto you" business. fortunately dan appeared to be just as clueless as to the going-ons as i was, and we basically sat there while all around us everyone (including cymara, john sanzi, and his friend ernie) seemed to know what to do, how to act, what to say, like we were privy to some secret society. 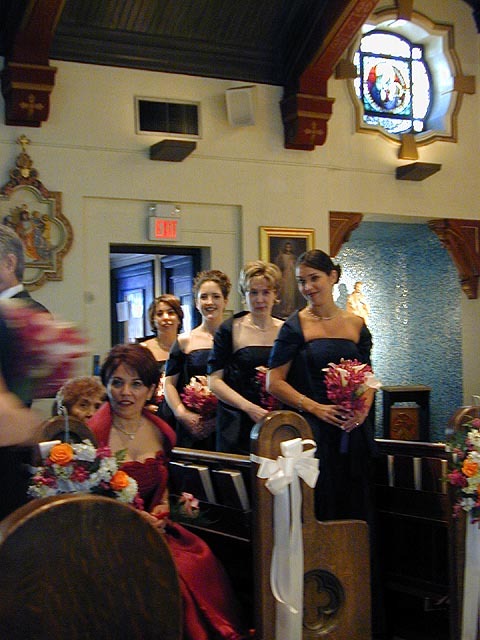 when the service was over, the bride and groom marched out of service chamber, followed by the bridesmaids, groomsmen, and family. as the guests walked out, we got an opportunity to congratulate the family and the happy couple waiting for us by the doorway. i met deanna's parents for the first time, her mother knew me as the "weblog guy." 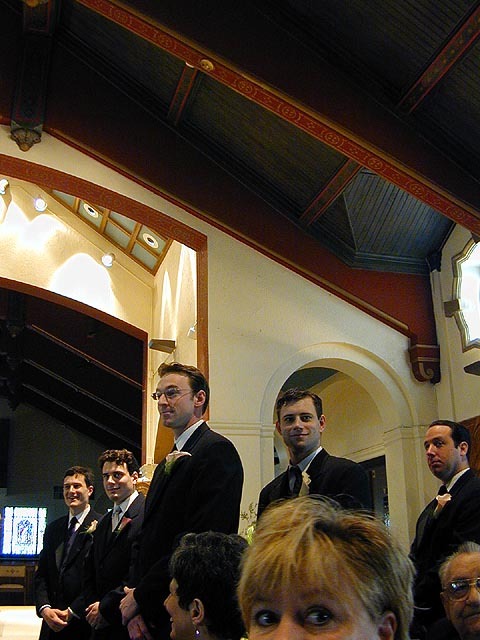 everyone waited outside for john and deanna to walk out of the church. we hooked up with former coworker eric and his wife csilla. eric was dressed in a fancy tuxedo versus the plain black business suit dan and i both wore. 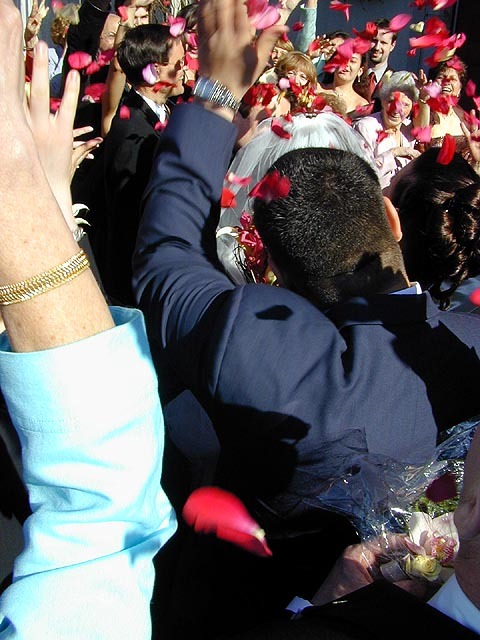 the photographer directed the crowd as to where to stand seconds before the happy couple came out under a shower of guest thrown rose petals. after some mingling, the happy couple escaped inside of what appeared to be a white bentley, modified to honk "here comes the bride" as they sped away drinking champagne in the backseat, followed by two white limousines. we stood around as the remaining crowd slowly dispersed. with a few hours left to kill before the reception at 7pm and feeling hungry, we decided to drive down to the carltun about 20 minutes away (the reception place, next to a country club of some sort) and then look for a place to eat. i followed eric as he lead us on a meandering u-turn filled drive to our destination. we decided to grab something simple at bertucci's. we received curious stares as we were slightly overdressed for a franchise pizza restaurant. csilla asked me about chinese languages and revealed that she recently came back from a trip to hong kong (sars!). we ordered a large neapolitan margherita pizza with a side order of tuscan chicken wings. maybe it's because i was hungry, but the slice of pizza i had was delicious and the chicken wings were amazing. i've never been much of a bertucci's man, but i might have to reverse my position. we left the restaurant, getting some gas at a nearby gas station before going back to the carltun. back at the reception hall, servers greeted you at the door with flutes of champagne. 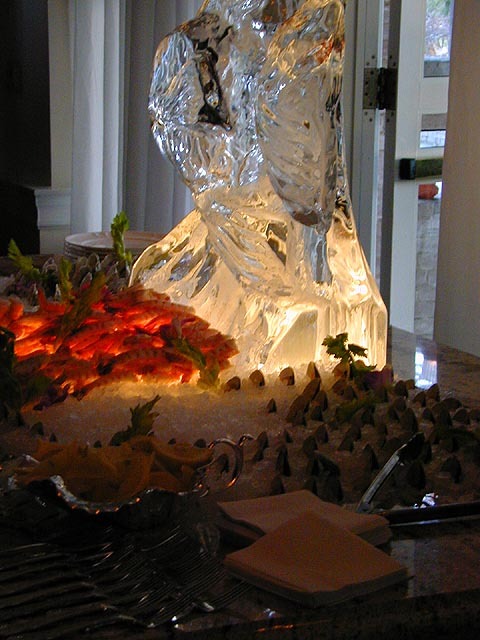 everyone was ushered into an adjoining chamber for some hors-d'oeuvres. more servers stood in a row holding trays full of sushi as we walked into the room. out back, the photographer was still busy taking group wedding photos. i sat in front of the fireplace and periodically someone would come by to offer me food, which i more often than not accepted. megan came to sit with us, revealing to me how one of the underaged bridesmaid (who swears she never drinks) had already drank 4 glasses of wine and the other bridesmaids were now making sure she didn't have anymore, making her drink plenty of water. deanna also came to sit with us, gobbling down a plateful of food while receiving a lecture from the photographer. around 8pm everyone was ushered into the dining chamber which also substituted for a dance hall. john and deanna had the first dance (the song, of course, was some frank sinatra tune, performed by a live band), the room erupting in flashbulbs as people captured this kodak moment. we were all placed at the same table, the boston contingency of the room (other than erin, whom i've met from last summer's hampton trip). 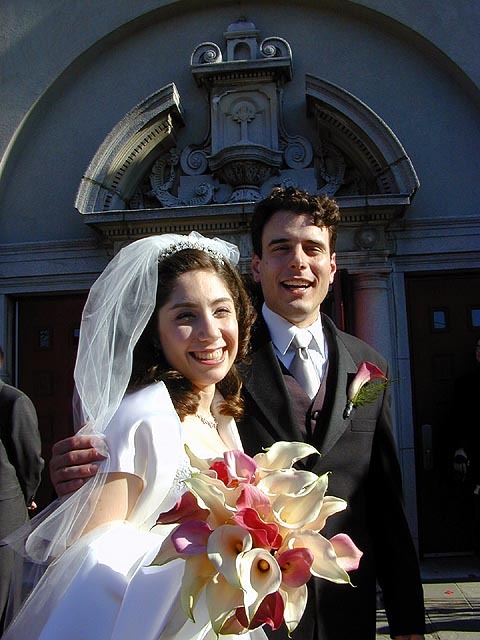 a tall floral arrangement was the centerpiece. on the table were also gifts for the guests, heart-shaped metal winestoppers. we passed the obligatory disposable camera on the table around, taking photos of one another. a good portion of the rest of the evening was marked by either dancing or eating, or, in my case, just eating, as my streak of never dancing in public continues. after the salad came the main course, a choice between fillet mignon, some kind of fish, or game hen. i had the game hen, quite delicious, but from all the hors-d'oeuvres and the bertucci's, i didn't have my normal hearty appetite, so it was a struggle to finish my dinner. dessert was a plate combination of a cannoli, a strawberry dipped in chocolate but shaped so it looked like a tuxedo, and a dish of creme brulee. 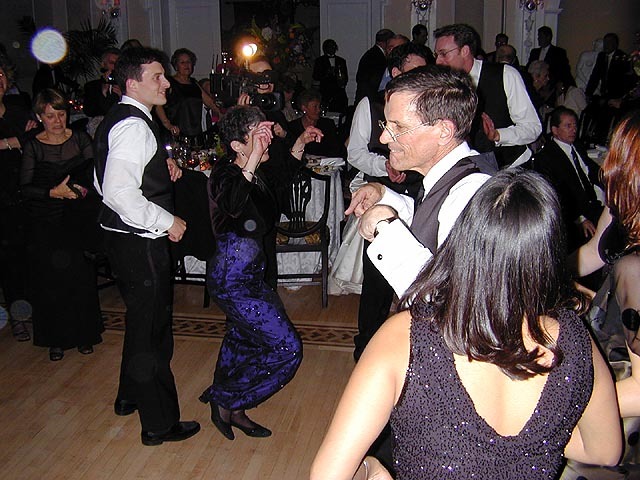 the music that was playing was heavy on the disco, which was a hit with the guests as they filled the dance floor. i was the guy by myself at the table, talking sips of my soda or water everything couple of seconds, watching everyone dance. sometimes i wonder what it'd be like to know the joys of drinking and dancing! then i shake my head and go back to my ascetic lifestyle. 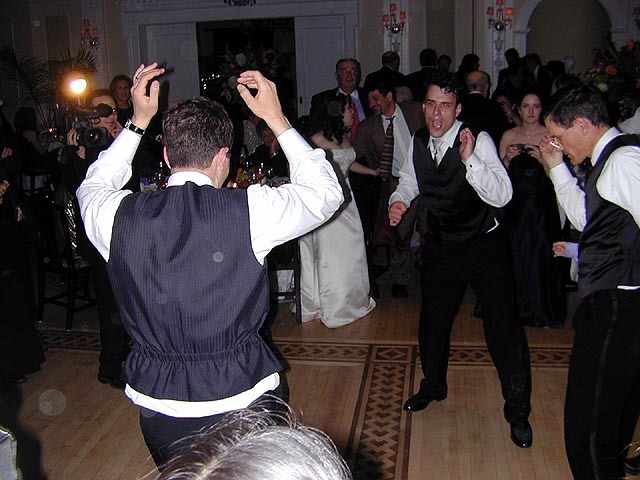 i was amazed to see how the miller family has wholeheartedly embraced dance fever: not only were the brothers cutting the rug, but the parents were seriously oogie booging as well. 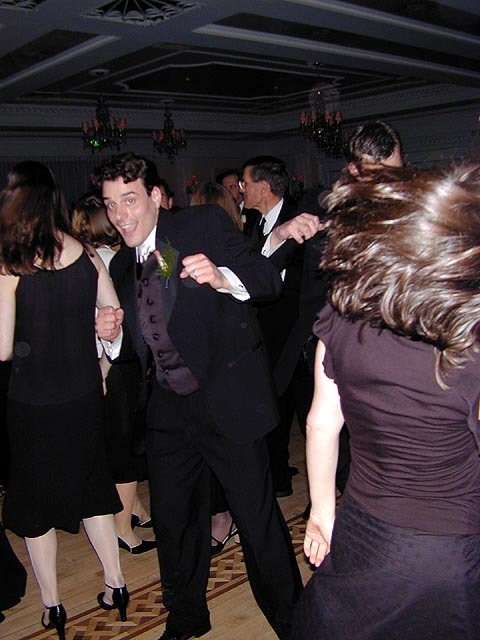 with all that dancing, perhaps members of the wedding party should've rented some comfortable hammeresque dancing jumpsuits instead of those stuffy tuxedos. a note on phototaking: because there was a professional photographer and his crew of lightbearers, i had to practice a more guerrilla form of phototaking, grabbing snapshots when i could. i had a feeling that the photographer there wasn't happy with so much phototaking going on, because the multiple flashes have a tendency to ruin his white balance. another thing that i did occasionally was just to follow the photographer, shoot what he shoots, steal his shots. also a few years ago, digital cameras were somewhat of a novelty item, but now they're a lot more common. at least half of all the people there had digital cameras, the demographics being mostly the younger guests. after the cake cutting ceremony (three tier chocolate cake) came the parent-child dance portion of the program. 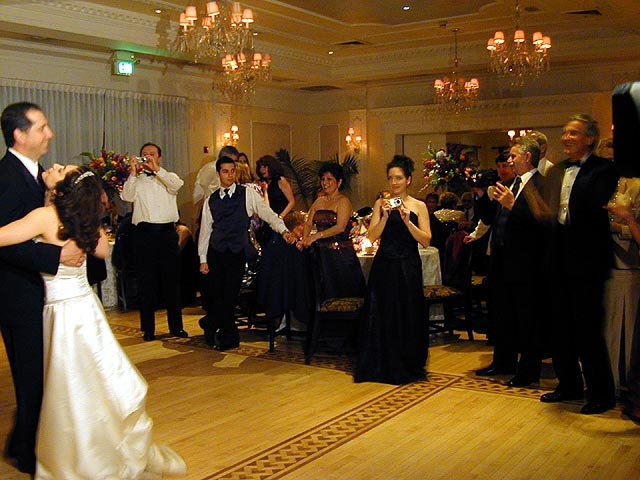 the dance floor was cleared so deanna could have a dance with her father, followed by john dancing with his mother. 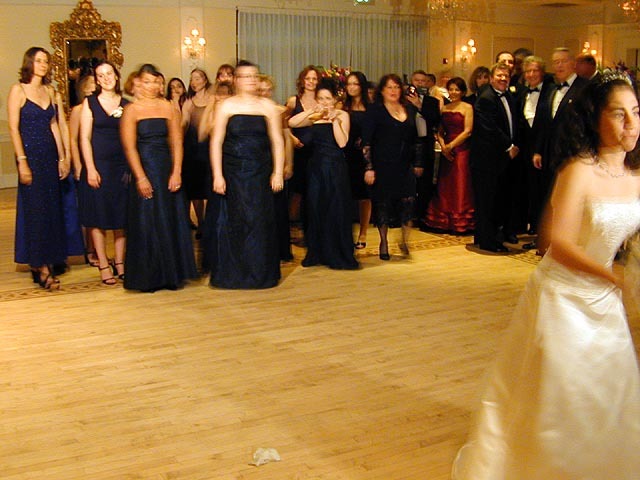 then came the bouquet toss, as all the single girls bevied behind deanna (some willingly, others reluctantly dragged out) as she tossed a clutch of flowers over behind her head. also around this time dan did me and favor and helped me get my crate & barrel gift out of the car (box slightly wet in the corner from the rain earlier) and put it on the gift table. even though my present wasn't wrapped, i was happy to see that it was the BIGGEST present out of all the other guest brought presents on that table. the wedding finally drew to a close around midnight, after tom gave his best man speech, deanna's father thanked everyone for coming, and john miller told the story of how deanna asked him out in college. after we said good bye to john and deanna, we left, some of us taking parts of the flower arrangements as souvenirs. once we got in the car, little did we realize, our evening was just getting started. because i followed eric here, i had no recollection of how to get back to where we came from. the maps that we had weren't detailed enough to show us how to get back. driving blind, i just knew we had to go in a westernly and northernly direction. a trip that should've taken maybe 30 minutes at most took an hour and 30 minutes as we ended up all the way in queens, before getting on the long island expressway and finally finding our motel. despite the late hour, when we pulled into the parking lot, one of the rooms was having an open-doored party populated with suspicious seedy elements of society. as we got to our room, everyone quickly went to bed after a long day.